Protect PHP scripts with compiled bytecode for best performance and protection. Use optional encryption keys that are not stored but generated only when needed (Dynamic Keys). Our unique feature gives greatly increased protection over alternatives that store a decryption key in the protected file or that do not offer encryption at all. Produce encoded PHP files to run on the latest PHP 7.3 and earlier. Use PHP language features up to PHP 7.2. Encrypt non-PHP files such as XML and templates. Generate license files to restrict access to encoded files (Pro/Cerberus editions). Enable one way transformation (obfuscation) of variables and function, method and class names. Prevent file tampering through use of digital signatures. Prevent replacement of encoded files by others. Generate files to expire on a given date or after a time period (Pro/Cerberus editions). Restrict files to run on any combination of IP addresses and/or server names (Pro/Cerberus editions). Restrict files to run on specific MAC addresses (Cerberus edition). Integrate with the ionCube Package Foundry. Add readable comments to encoded files for custom copyright, license details etc. Have custom messages and custom handling when files expire or aren't permissioned to run. The ionCube Standalone PHP Encoder is the leading script protection solution for PHP based software. 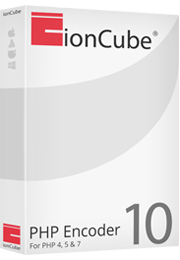 Launched in 2002, the ionCube Encoder was the first truly affordable, robust and fully featured encoding solution for PHP. It is now an established industry standard solution, trusted by developers in over 150 countries around the world, to encode PHP. It has led the way with features often immitated but unrivaled, and now with integration of the ionCube package Foundry, provides the only solution that in seconds and with a single click can secure your code, and produce a self contained installer to install and deploy your protected product to a local or remote server. ionCube protection uses 100% compiled PHP, and utilising a closed source execution engine, ionCube Encoding tools deliver the best performance and PHP source code protection of any encryptor solution currently available. With features to meet the demands of both small and enterprise scale applications, the ionCube Encoder's unrivaled PHP protection, performance, and all round flexibility and featureset, is the ideal and only serious no-compromise solution for protecting PHP. All ionCube Encoders offer a sophisticated command line tool. This is essential for exploiting the advantages that automated encoding can offer. The Windows and OS X versions also include a powerful Encoder GUI. The GUI is easy to use, offers high-speed encoding, and is packed with features to maximise your productivity and simplify product deployment. In addition, a low cost GUI upgrade extends the standard features adding builtin ZIP and tar.gz archiving, automatic FTP support and a dynamically customisable GUI that can prompt for user defined project-specific parameters.